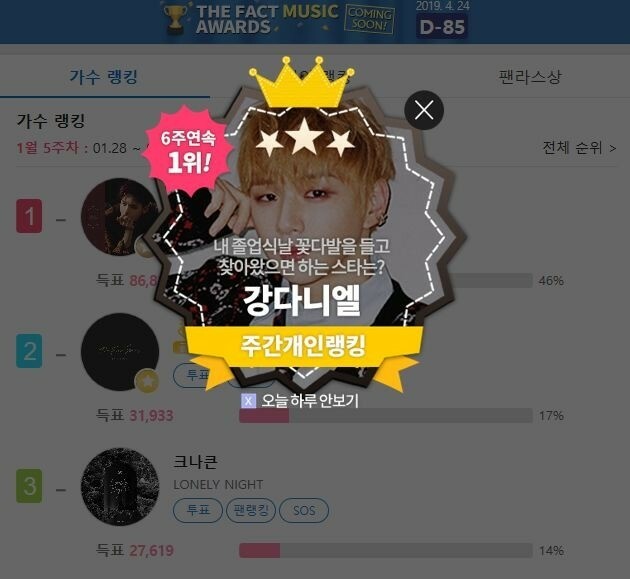 [THE FACT] Daniel Kang from the group Wanna One has ranked first for six consecutive weeks in individual ranking of ‘FANNSTAR’. From January 21~28, ‘FAN N STAR’ has opened the 4rd week ranking with the subject ‘The idol star to bring flowers on my graduation is?’. Daniel Kang ranked first by getting 347,664 votes in individual ranking. Followed by JR of Nu’Est with 107,364 votes as 2nd, and followed by Wow of A.C.E with 105,200 votes as 3rd place. With the new of Daniel Kang’s first place, the fans with nickname 'windfateis' said, “Precious, lovely Daniel Kang… You’ve been doing good and I know you will be able to do whatever you are planning to do.. We will be your friend and support you by your side.. Let’s be the crutch for each other…! Cheer up Daniel Fighting! And even its not any celebrating day as graduation, thank you for being with us as a gift which yourself is a fancy flower… Congratulations for the 1st place in FAN N STAR!”. Meanwhile, ‘FANNSTAR’ is holding ‘THE FACT MUSIC AWARDS’ at Namdong Gymnasium in Namdong-gu, Incheon on April 24.